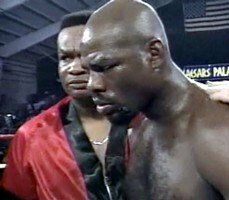 As he is often fond of saying whenever he grants an interview, former three-weight champion Iran Barkley never had things easy during his career. The blood and guts warrior who gave his all in memorable battles with the likes of Thomas Hearns, Roberto Duran, Nigel Benn and others, can come across as bitter at times – bitter over how he feels he was not paid the type of big money he should have been and bitter over how he feels he was “robbed” in some of his fights. But Barkley always gives a good interview – with a career full of great fights, how could he not – and today, recently married, the 55-year-old comes across as more upbeat and cheerful. ESB has had the pleasure of speaking with “The Blade” on a number of occasions and each time he has been kind enough to grant some of his time, Barkley has proven a very interesting subject.